The New York City Police Museum (NYCPM) celebrates the history and contributions of the New York City Police Department, established in 1845. The museum is located in Lower Manhattan in New York City, near Wall Street and the South Street Seaport. While one of the museum's primary focuses is a memorial to September 11th, the museum contains a wide range of information on the history of the NYPD. The museum, which grew from a gallery housed at the New York City Police Academy, opened at 26 Broadway at Bowling Green in January 2000 and re-opened in a new location at 100 Old Slip, former home of the First Precinct, in January 2002. In October 2012, Hurricane Sandy caused substantial damage at 100 Old Slip, and the museum reopened on October 24, 2013 at 45 Wall Street. That location closed in 2014 and the museum's future plans are unclear. It also allows visitors to simulate a police firefight, and judges whether or not the shooting was correct, allowing civilians to have some understanding of situations that police face and provide them with a better understanding of the work of police officers than that provided by the media. Its exhibits are not without controversy, and city historians have accused the museum of omitting coverage of more controversial aspects of NYPD history. On February 16, 1998, plans for a police museum were unveiled when then-Police Commissioner Howard Safir and the Alliance for Downtown New York (the local Business improvement district) made $5 million available for the museum in return for a new police substation in Lower Manhattan. Funding for the museum was criticized and classified by some as the buying of police protection for a given area at the expense of another that could not afford to broker a similar deal. As a result, Mayor Rudy Giuliani cancelled the funding for the museum two days later. In March of the same year, the New York City Police Museum non-profit corporation was created, and in April 1999, the museum opened, although the official unveiling was not held until January 19, 2000. As of its January 2000 opening, the museum was privately run with support from the city, including more than ten years of free rent and staffing by police officers. Private donors provided more than $2 million for the construction of the museum, while the city contributed $1 million. The museum has been criticized by some who believe it glosses over some of the low moments of the department in its quest to show the good work of the Department. The new museum replaced a small gallery that had been housed in the police academy on East 20th Street. Among the exhibits brought to the new museum are: a display of the evolution of police uniforms since their inception in 1853, a gun used by Al Capone's gang in the 1928 murder of Frankie Yale, the first machine gun used in a gangland killing in New York, and a gift from Italy to the City of New York following the assassination of Lieutenant Joseph Petrosino in Sicily in 1909, the only member of NYPD to be killed in the line of duty on foreign soil. Other exhibits include a green and white radio car, antique firearms and a wooden desk from the 46th Precinct in Morris Heights, The Bronx. Its new exhibits included a 1972 Plymouth Fury, a model of a jail cell, a timeline of transportation, lock-picking tools belonging to Willie Sutton, an extensive exhibit on September 11 that occupies the museum's third floor, and a Hall of Heroes that includes the name and badge of every NYPD officer killed in the line of duty, starting with David Martin on August 6, 1861. Although the new museum was significantly larger, it is still not comprehensive, its omissions of controversial incidents receiving the same criticism it did at its previous location. The exhibit that the museum assembled for the first anniversary of the September 11 attacks allowed visitors to gain an immediate impression of the physical damage caused by the attacks and the debris that fell around Ground Zero. ^ Verenea Dobnik (2001-12-28). "New York Police Museum will Memorialize Sept. 11". San Antonio Express-News. Retrieved 2008-06-11. ^ Verena Dobnik (2001-12-27). "Police Museum Opens Blocks from World Trade Center site". Associated Press. Retrieved 2008-06-11. ^ a b "Brief History of the New York City Police Museum". New York Daily News. 2001-04-22. Retrieved 2008-06-11. ^ a b c d e Kevin Flynn (2000-01-23). "New York's 'Finest': A Burnished History; Police Museum's Unabashed Mission Is to Back Up a Nickname". The New York Times. Retrieved 2008-06-11. ^ Jayson Blair (2000-01-20). "City Police Museum Opens Downtown". The New York Times. Retrieved 2008-06-11. ^ a b John Marzulli (2000-01-20). "Finest Show in Town". New York Daily News. Retrieved 2008-06-11. ^ The brothers, who established their partnership in 1901, and were better known for their elegant Long Island and Newport residences, were the sons of Richard Morris Hunt. ^ Landmarks Preservation Commission: First Precinct Police station, 20 September 1977 Accessed 2 December 2008. ^ New York Architectural Images: First Precinct Building. ^ a b Robert F. Worth (2001-12-26). "On Display, Once Again, Artifacts of Police Past". The New York Times. Retrieved 2008-06-11. ^ a b "Police Museum Opens Blocks from World Trade Center". Fox News. 2001-12-26. Retrieved 2008-06-11. ^ David W. Dunlap (2001-07-31). 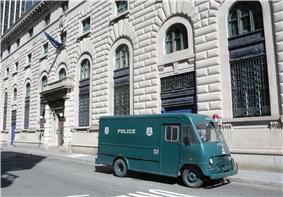 "Old Station House Returns to Police Duty; Headquarters of First Precinct Until 1973 Will House the Police Museum". The New York Times. Retrieved 2008-06-11. ^ Seth Kugel (2007-02-04). "Loitering in the Halls of Justice". The New York Times. Retrieved 2008-06-11. ^ Clem Richardson (2002-09-09). "9/11 Display Stands Out". New York Daily News. Retrieved 2008-06-11.